We have all heard this repeatedly: “You have to have unit tests. Unit tests are how you find issues in your code and fix them before they hit the trunk.” Ok, so that argument sounded a little weak. Here is a much stronger version of the same argument. You have to write unit tests because unit tests are a scientific mechanism to verify that your implementation satisfies the specification (that is, you code does what you say it does). To elaborate, your claim of what your code does is a falsifiable hypothesis in that it is possible to conceive of an observation that could negate your claim. Unit tests are the experiments that can be performed to test your hypothesis. If all your unit tests pass, then it is increasingly likely that your claim is correct. (Note that we cannot claim to have proved correctness; that is an impossible task in the general case). This still an unsatisfying argument at best. What if I were a perfect developer who writes perfect code, and everyone around me agrees that I write perfect code. Do I still need to write unit tests? Or what about the cases where visual inspection of the code makes correctness obvious. Do I still need to spend precious time writing unit tests? While verification is an important reason to have unit tests, IMHO, it is also the least interesting. There are many more reasons to be rigorous about unit tests. Unit tests makes the best documentation for your code. We were all hired as software engineers because we can write good software. That means a lot of us are not very good at technical writing, and for many of us, English isn’t our native tongue. This creates barriers for us in communicating what our software does so that others can use it well. We could write wiki/docs describing what our code does, but that has three major issues. As the code evolves, the documentation becomes obsolete. 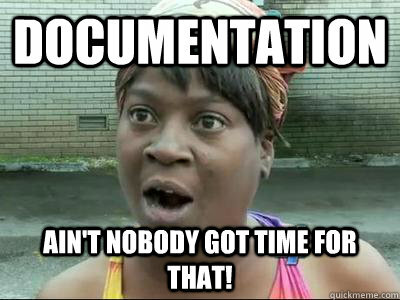 The only thing worse than no documentation is wrong documentation! What we could really use it a mechanism that leverages our strength (writing software) to create documentation, and automation to ensure that documentation is never obsolete. Unit tests turn out to be the perfect tool for this! Think of each unit test as a how-do example of how to use your code. So, if anyone wants to use the code that your wrote, all they need to do is look at your unit tests, the job is done! A great example is the folly library. Let’s take folly Futures for instance. The primary header file Future.h tells you the API, but figuring out how to use it is not straightforward from there. However, go over to the unit tests at FutureTest.cpp, and you will come away knowing how to use Futures for your use case in a matter of minutes. For each minute spent by a folly developer to write these unit tests, it has saved thousands of developers countless hours. There are many other things that work better when you have unit tests.